Be the first to share your favorite memory, photo or story of Romaine. This memorial page is dedicated for family, friends and future generations to celebrate the life of their loved one. 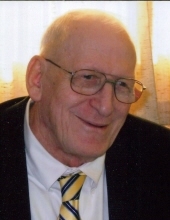 Romaine W. Murd, 87, of Tiffin, formally of Murd Rd., Richfield Center, Sylvania, Ohio, died peacefully on February 9, 2019. He was born December 11, 1931 to the late William N. and Madelyn (Helfrich) Murd. Romaine had worked for several years at the former Toledo Concrete Pipe and Tube and as a farmer. Survivors include one sister, Bernadette Inderrieden of Berkey; two brothers, Jerome (Donna) Murd of Berkey and Rev. Francis Murd of Tiffin; sister-in-law, Charlotte Murd of Toledo; seventeen nieces and nephews; thirty-two great nieces and nephews and several great-great nieces and nephews. He was also preceded in death by brothers, William, Karl and Donald; brother-in-law, Ronald Inderrieden; sister-in-law, Rita Murd; and great nephew, Derek Brown. Visitation for family and friends will be from 9:30 a.m. until the time of funeral Mass at 11:00 a.m. on Wednesday, February 13, 2019 at Immaculate Conception Chapel (Holy Trinity Parish), 1750 N. Raab Rd. Marygrove. His brother, Rev. Francis "Frank" Murd, his cousin Rev. Thomas Helfrich, and Rev. Michael Dandurand will concelebrate. Burial will follow in Immaculate Conception Cemetery, Marygrove. To send flowers or a remembrance gift to the family of Romaine W. Murd, please visit our Tribute Store. "Email Address" would like to share the life celebration of Romaine W. Murd. Click on the "link" to go to share a favorite memory or leave a condolence message for the family.